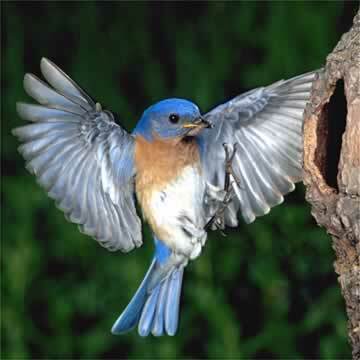 Bluebirds are members of the thrush family. Their musical song is very entertaining. They feed on insects most of the year, but will revert to fruit as a food source during winter months. Size: 6 1/2- 7"
Description: Larger, fatter than a sparrow. Head, throat, wings and tail are bright blue. Chest and part of back is rust red. The female is paler in color with a grayer throat and belly. Juveniles are grayish with some blue in the wings and tail, speckled and lacking rust color. Similar species: Mountain Bluebirds have a blue chest and are less commonly seen. Habitat: Open coniferous forests, brush, deserts, roadsides. Range: Breeds from British Columbia, western U.S. to mountains in central Mexico. Song: A short pew or mew. Chattering note when communicating with each other or as a distress call. Diet: Insects. Birders have observed Western bluebirds at suet feeders. Nest: In a natural cavity, building cavity or nest box. Nest is made with grasses and forb stalks. Inner cup lined with finer grasses. Female builds the nest while male accompanies her. Eggs: Commonly 4-6 which average 20.8 x 16.2 mm. Eggs are oval with a smooth glossy shell. Pale blue to bluish white and sometimes white in color. Incubation: Female incubates for 2 weeks. 2 broods. Chicks: From the time they hatch to the time they fledge is approximately 21 days. Mating: Bluebirds generally mate the year after they hatch. Often, they are less than one year old. Most Western Bluebirds mate for life. The Eastern Bluebird is most likely to be confused with other bluebirds. Male Western Bluebirds have blue throats while male Easterns have orange-red ones. Male Mountain Bluebirds lack any reddish coloration on their underparts. Females are more difficult to separate. Both Western and Mountain Bluebirds have gray throats and gray bellies while the Eastern Bluebird has a brownish throat and white belly.